Momma Told Me: There's enough clutter in this country to clothe the world. I still recall the first time I walked into a Salvation Army, tightly gripping Momma's hand, eyes wide with wonder at the seas of white basins, mounding over with forgotten clothes. It was unlike any store I'd ever been into before. There was an odd aroma in the air, I could not place, and people feverishly combing through racks double my height, with everything from ball gowns to jeans. Usually on our excursions out I'd be permitted to select one item, in tandem with good behavior. Momma had to hoist me up to see into the children's clothing bin; in my eyes a ball pit of rainbow fabric. In no time I had clutched onto a bright pink pair of overalls with a teddy bear applique. I look up to Momma with hope in my eyes, wondering if it was within my 'budget' (I was much too young to have a clear concept of value or money). On the left lapel where was a colored scrap of paper stapled to the denim, Momma inspected this piece of paper then looked down at me. "Yes, and you can pick out another!" I was in love. Long before I could comprehend the delicate balance of our environment, and the waste we create within our lifetimes, I had a romantic fondness for the notion of re-purposing. There was something inherently magical that I could walk into a store and purchase something otherwise discarded by it's previous owner, and love it just as much, or more, than in it's heyday. As a crafter, we typically frequented second hand stores with the sole intent to up-cycle, or repurpose, though I'd often find treasures of my own. Of course, through the years, I began to see the extended benefits of what we were doing, in recycling our own forgotten treasures, and purchasing those of others. Over 250 million tons of waste is generated and thrown into American landfill each year, and of that, roughly 30% is actually recycled into new materials. Of the constant output of waste, generated worldwide, an estimated 5% annually is used textiles (think clothing, blankets, tablecloths, etc). In my opinion this is one of the most upsetting statistics; there is virtually no reason a fabric based product should ever be thrown out- barring severe wear and tear. We live in a world were mechanical laundering is not only common, but typically taken for granted, and our own citizens (even our Veterans) go cold at night. When you are without a warm meal, or shoes on your feet, in the middle of Winter you care not what brand the shirt is on your back, or the pattern of the blanket around you, you are simply grateful for their existence. You don't have to be Betty Homemaker to cut down on material waste- I live in a town where we have 7 identified drop bins for clothing collection. It doesn't get easier than taking the old clothes you were about to toss in your garbage bin, and dropping them into a slot on your way to drop the kids off at school. This is something I try to do twice a year, and even at that it seems we always have clothing that doesn't fit, or hasn't been worn in ages, just lying around in our closet. When my grandmother passed away earlier this year my younger cousins had mentioned an intent to sew some of her old clothing into baby blankets, for her grandchildren; so that her love and memory could touch children for generations. Somehow I had never heard of this concept before, as ingenious as it seemed. To take squares of fabric from a loved one's clothing and sew them together in mini-quilts for memorial is a touching and green concept. So I set out online to see if anyone was offering a service like this, memorial, or otherwise. 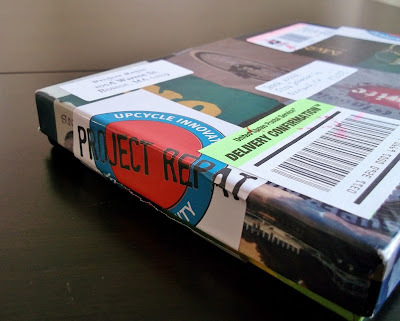 As it turns out, someone was; Project Repat. Short for 'RePatriot,' Project Repat focuses not only on the re-purposing of old textiles, but individuals. Their unique business model puts Americans to work at respectable jobs, earning fair and living wages repurposing old T-Shirts into scarves, handbags, and blankets. Repat is 100% USA, creating jobs and products within our country; something extremely important to me as the granddaughter of a Navy veteran. I understand that we cannot always buy USA made, but I try my best to whenever the opportunity (and knowledge of origin) is present. Putting money back into our own economy benefits us all, even if at a cost of a 2% markup over foreign goods. But with Project Repat, you're not only helping bring dignity to individuals otherwise jobless, and buying American processed, re-purposed, goods- you'll find T-Shirt quilts at 1/3 the price of alternative options. 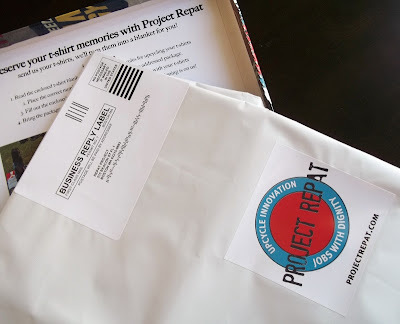 Project REPAT is a company of very real people, with a classic American feel for customer service and quality. When you arrive on their site you'll often be greeted personally within a few minutes. During my last visit Repat President, Nathan, flagged me down via the site's interactive customer service chat. While Repat originally began as a non-profit initiative involving the selling of T-Shirts reclaimed from Africa, the business model changed as the owners noticed a practical need for T-Shirt re-purposing. What if they could provide Americans real income earning jobs, while cutting down material waste, and offering a really unique product? All that was missing were some worthy and dedicated employees; after all President and CEO, Ross and Nathan weren't professionally textile inclined. And boy have they compiled some great Production Partners; NuPath Inc- a non-profit which employs individuals with disabilities, Precision Sportswear- a manufacturing company out of Fall River, MA (my Father's hometown) who has overcome generations of industry obstacles, and Opportunity Threads- that offers meaningful textile jobs out of North Carolina. 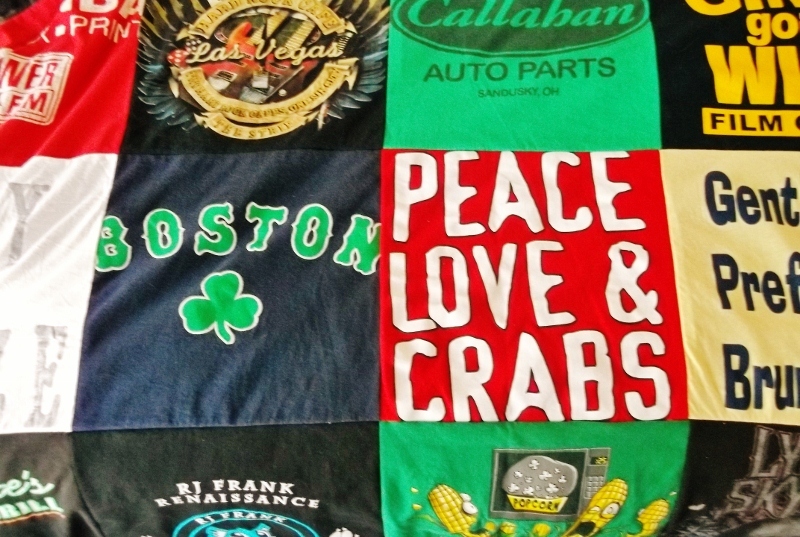 So how does one purchase an amazing T-Shirt quilt blanket made from their own up-cycled threads? The process is incredibly streamlined, and cost effective for the consumer. Simply visit Project Repat and add the blanket size of your choosing to check out. 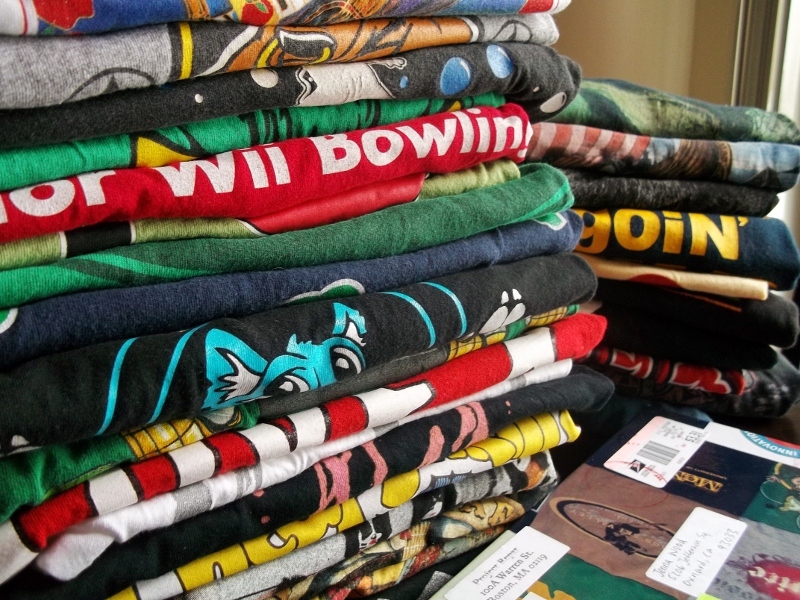 Be mindful that the various sizes require different quantities of old T-Shirts, ex; 4' x 3' = 12 shirts, and 7' x 7' = 49. These formulas are based on the 1' x1' squares Repat will cut from your shirts, and then sew together back to front, or front to fleece, depending on your chosen backing. Once you have paid for your blanket online you will receive a very colorful Project Repat box in the mail including an official order form (for placement instructions and special requests, as well as identification), and postage paid return mailing bag.I should note that the customer does not pay any additional shipping fees out of pocket; all of those are included in your initial purchase price. When our Repat box arrived we already had 24 of our own, personal, retired T-Shirts set aside, with a requested 30 for completion. I didn't hesitate to take the other half on over to our local second hand store and scour the racks. We found some really great local shirts that pertained to local hangouts and themes to fill in our remaining 6 slots. I paid less than $5 for all 6 shirts, and the profits went directly back into my community through the thrift organization (WIN!) When we got home we neatly folded all 30 of the blankets as best as flat as possible and began sliding them into the prepaid mailer bag. The bag is made of thick plastic, but still tested the laws of physics with our 30 shirts (half of them were rather excessive in fabric at a size 2x). In the end I scrunched every last shirt in, almost forgetting to include my order slip, and taped the sucker up with a generous portion of duck tape. It was dubious whether my local post office would accept it but the parcel miraculously made it to Repat without incident. The average production time for these blankets is 5-7 weeks. (So get those holiday orders in now!) However, you may 'rush' an order for a 1-2 week turnaround for an additional $50. Ours arrived within 3 weeks; though I suspect this is due to a media rush for our posting deadline. Air on the side of caution, especially this time of year, and anticipate an average 5 week production period. I could hardly wait to see our beautiful Project Repat creation and was beyond thrilled with the detail and quality in craftsmanship. It was clear skilled workers had processed our shirts and carefully sewn them together; with a lovely little fringe border around the outside. The majority of our 'fronts' are arranged on the main 'front' side of the blanket, where some printed backs appear checkered throughout the back. 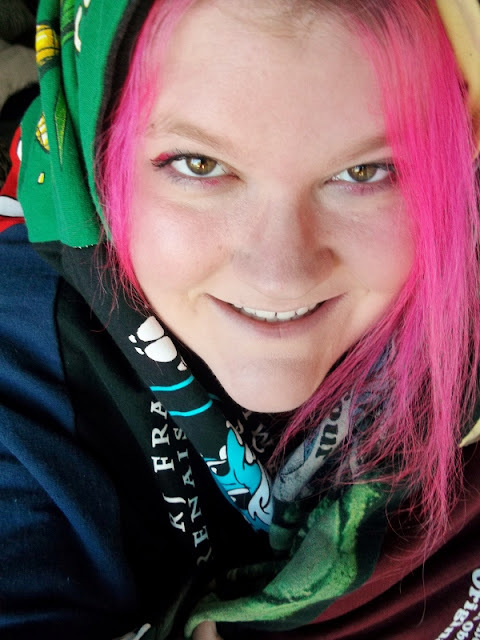 I have to say I'm fairly pleased with the cropping decisions and placement; though you can literally layout your blanket shirt by shirt for a nominal extra charge. Our Repat blanket is buttersoft to the touch thanks to all of the processing (wear) we meticulously put into the shirts over the years, and quite warm considering is is double layered cotton. Repat is now offering baby blankets, a great way to memorialize your little one's first years; and would make a wonderful gift for any college student. In truth, I could see limitless cases where a custom T-Shirt blanket would make a very meaningful gift, and the eco-friendly, American made, initiative behind the company is simply the icing on the cake. If you are looking for a one of a kind family heirloom or gift this holiday season look no further- place your order today and enjoy an exclusive (and generous) 25% discount with code: mommatoldme. What Daughter Says: Be part of an amazing movement, support American jobs, cut material waste, and experience the awesome 'T-Shirt Blanket,' with Project Repat. One Momma Told Me reader will have the privilege of putting together their own 5' x 6' T-Shirt Blanket from Project REPAT. I didn't learn anything new, I'm sorry. I think I learned everything I didn't already know from your blog post, lol! 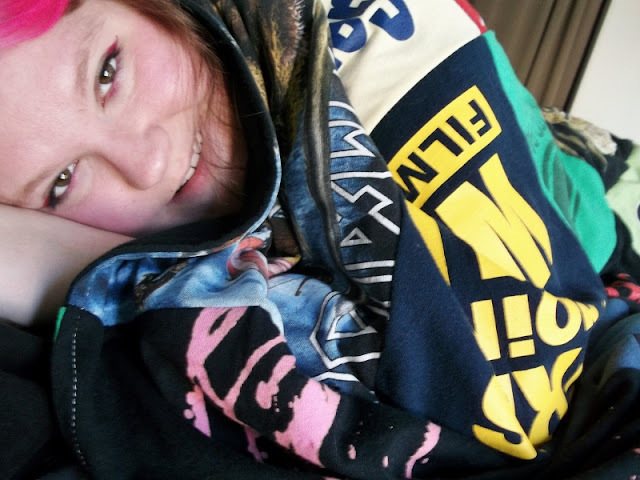 I love these blankets! That is such a cool idea. I love these blankets! 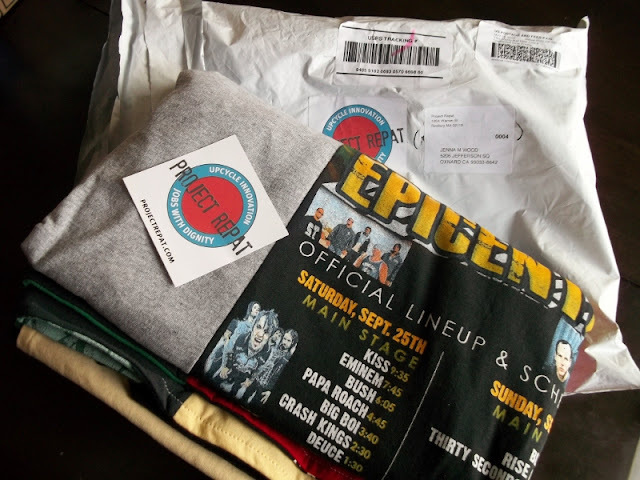 Pretty cool that you send in your own tees and in 5-7 weeks you get a blanket! I am going to start saving my tees! What does that "Youth Trade" logo on your tags mean? YouthTrade certifies young mission-driven entrepreneurs under the age of 35 and provides them with access to markets. Inspired by Conscious Capitalism, YouthTrade also aspires to reshape the capitalist machine to serve as a vehicle for positive change through promoting sustainable business practices, eco-friendliness and social responsibility. PS I think that these blankets would make awesome pet blankets. Using your old t-shirts perfect for puppies or dogs with separation anxiety. I learned that you can get a two sided blanket! I need one of these! 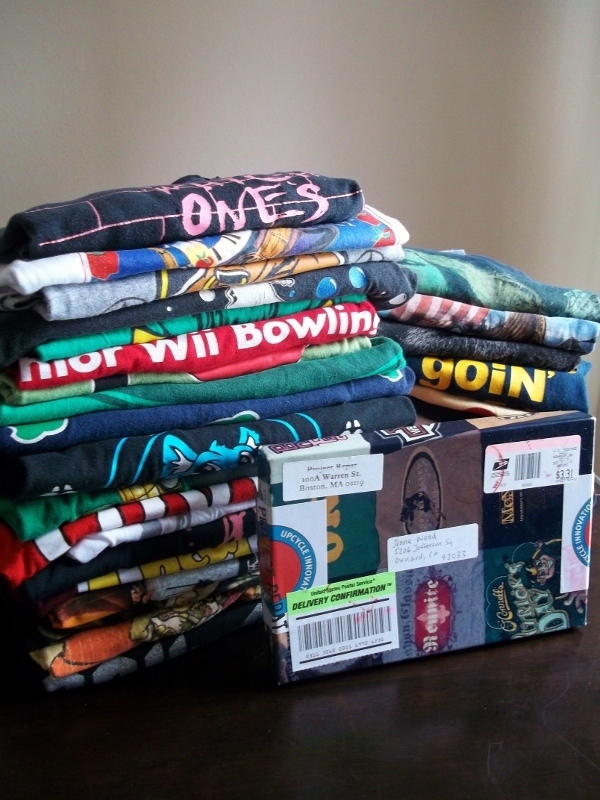 I have boxes and boxes of my kids' clothes that I have been saving since their births' to get them made into a t-shirt quilt! I had previously left acomment on this but I don't see it. Maybe I just went to their site and got lost in all its awesomeness. I found out that the Queen size costs $150! 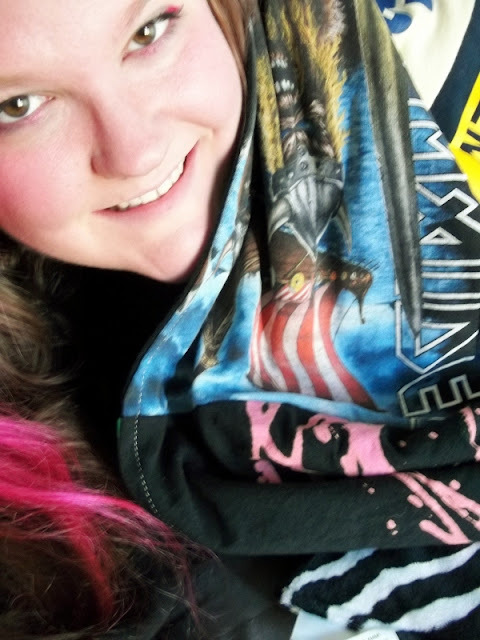 I have huge t-shirt collection and would love to have some of them made into a blanket! I must at this to my Christmas wish list! I learned that they consider themselves "upcyclers." Upcycling is such a fantastic thing to day. Gorgeous blanket too! If you place an order please send the shirts within a year :). Great for procrastinators!! i didn't realize how many shirts would be needed for a blanket. i love that you can help contribute to their creation. They also make fleece blankets which would be really warm! I learned that I absolutely need one of these made. i learned about the YouthTrade logo on their tags and what this means in regards to young entrepreneurs. What a cool idea! These blankets are not only beautiful but very earth friendly too! I learned that special requests take additional time and logistics, and therefore the company has to charge extra for them. Thanks. I learned their biggest blanket is a 7' x 7'. However, if you want something bigger you can contact them about it. 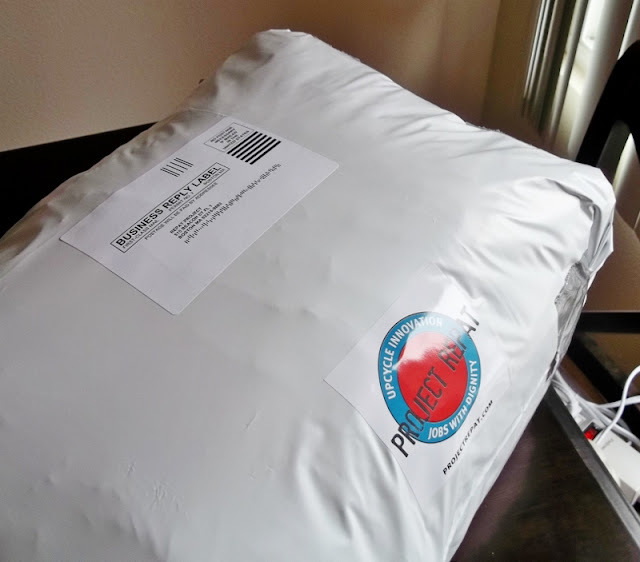 When you order a blanket sized 5' x 6' or smaller, we'll send you a blanket box with a pre-paid envelope into which you can place your t-shirts and drop them at the post office. Love this idea! Very cool! Oh, and the Rafflecopter form just said to enter a comment...it didn't say what kind of comment. From the other comments, it seems as thought we are supposed to enter something we learned from the website? I learned that their products are innovative, fun, fashionable and environmentally sustainable. 5% of material waste on Earth is used textiles! I learned that you can send in your tshirts to contribute. They take flannels, sweatshirts, and dress shirts. I learned that you can get a two sided blanket. I learned that you have up to a year to send in your t-shirts once your order is placed. you have a whole year to send in your shirts!! learned: How long do I have to send in my shirts after I order?